Dr. Ali Jabari graduated from the Tehran University of Medical Sciences School of Medicine and completed his residency program at the Salem Hospital. He also did two fellowships, one at the Brown University and the other at the Roger Williams Hospital. Dr. Jabari is specialized in Pulmonology and board certified in Internal Medicine, Critical Care Medicine and Pulmonary Disease. 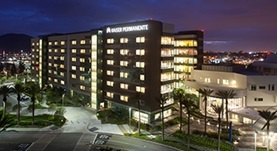 He has been in practice for more than 20 years and is affiliated with the Kaiser Permanente Fontana Medical Center.